Featuring the latest design technology, the 40-ton Terex Crane is designed for a broad range of tasks. It features a maximum load capacity of 40 tons. It has a telescoping boom that has a maximum length of 105 ft as well as a powerful Tier IV Cummins engine. 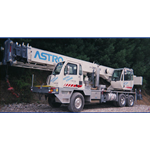 This hydraulic crane features an ergonomic design and completely independent hydraulic outriggers. In addition, this Terex Crane features a 49-ft offsetable jib and 150-ft maximum tip height.